I used to read every word that Nora Roberts wrote. I loved her romances and her trilogies and I didn't miss a book. As my reading preferences have changed, I don't read much romance and I don't like the trilogies that she writes because most of them have a lot of fantasy and magic in them. I do, however, like the new book that she publishes every spring in the Romantic Suspense category. These are longer books and have lots more character development than many of her earlier books. There is some romance in these books but it's definitely less than previous - the main focus is on character development and suspense. Her new book, SHELTER IN PLACE, is a real page-turner. This is a book with a plotline ripped from current headlines. Three young men go to a mall with the goal of killing as many people as they can. The number of killed and wounded people in the crowded mall and movie theater was extremely high but the book isn't about the shooters or the people killed. Instead, it looks at several people and how the shooting affected their lives in the years after. The two main characters, Reed and Simone, follow different paths but the nightmares and the survivor's guilt plague both of them. Simone isn't sure what she wants to do with her life and Reed knows that he needs to be a police officer. Both of these characters are very well written - both their strengths and their weaknesses. 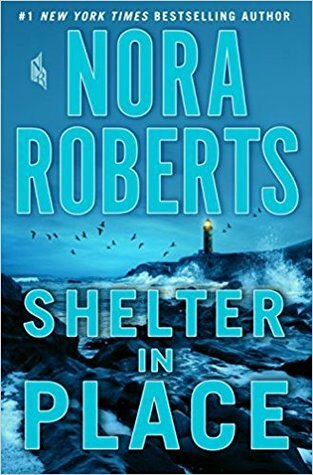 Shelter in Place keeps the reader turning the pages because there is another deadly plot that is going on that is connected to the shootings and is affecting many of the survivors. My main complaint about this book is that it's too long and there are way too many minor characters who are part of the story for a few pages and then just disappear. I think that this book could have told an even better and smoother story with about 100 pages less. I highly recommend this book but be warned that there is a lot of graphic violence that may make it difficult for some people to read. It's got a little bit of romance (very little compared to Nora's earlier books) and a lot of suspense and worth reading for the well-done plot.